We are AMBC Gold Certified! A little recognition always feels good. We normally don’t brag, but these awards from AMBC and Penske are totally worth mentioning. 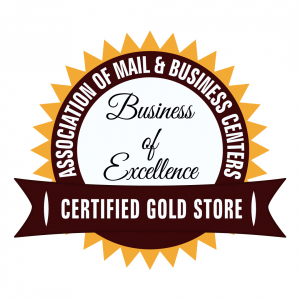 Box King has received recognition by the Association of Mail and Business Centers (AMBC) as a Gold Certified Store. AMBC is a national non-profit organization that provides education, training, and industry advocacy for retail shipping stores. AMBC offers Gold Certification recognition for retail shipping stores that meet and surpass strict industry standards for excellence. Owners or managers must have received a Masters of Retail Shipping Management degree. This comes from attending industry events, years of retail experience, and dedication to continuing education. Each store must also pass inspections on signage, carrier interaction, merchandising, and must maintain a less than 1/2 percent unpaid damage claims annually. Box King is proud to serve the retail shipping industry for OVER 15 YEARS! Even more proud now to have received this distinction of being an AMBC Gold Certified Store. Box King also received multiple awards at our recent Penske Truck Rental Awards Banquet. We were recognized as being a Top Revenue Leader in the Cincinnati area as well as being an Elite Performer. 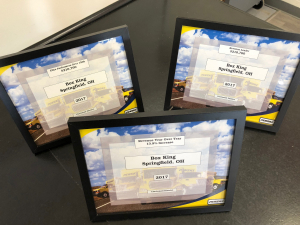 Achieving these awards is not really based on salesmanship, but more on being responsive to our truck rental customers needs. We have many valued business rental clients who are the bread and butter of our truck rental business. Without them, we would achieve none of these milestones. We are deeply appreciative of all our loyal customers and clients who we have been honored to provide service to. As Box King continues to grow and meet the demands of an ever changing shipping and retail world, we thank you for joining us on this journey. Here’s to many more years in service to you!